How do we make moral decisions? Can science writing be automated? URBANA, Ill. – Corn and soybean fields look similar from space – at least they used to. But now, scientists have proven a new technique for distinguishing the two crops using satellite data and the processing power of supercomputers. "If we want to predict corn or soybean production for Illinois or the entire United States, we have to know where they are being grown," says Kaiyu Guan, assistant professor in the Department of Natural Resources and Environmental Sciences at the University of Illinois, Blue Waters professor at the National Center for Supercomputing Applications (NCSA), and the principal investigator of the new study. The advancement, published in Remote Sensing of Environment, is a breakthrough because, previously, national corn and soybean acreages were only made available to the public four to six months after harvest by the USDA. The lag meant policy decisions were based on stale data. But the new technique can distinguish the two major crops with 95 percent accuracy by the end of July for each field – just two or three months after planting and well before harvest. 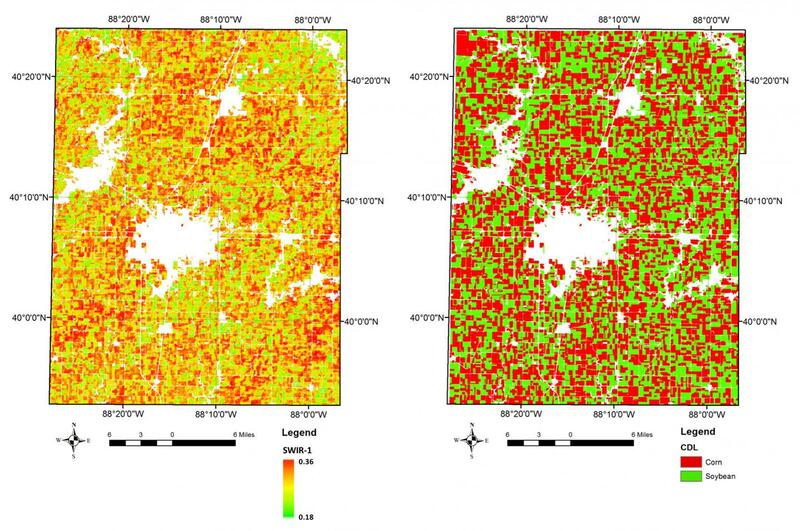 The researchers argue more timely estimates of crop areas could be used for a variety of monitoring and decision-making applications, including crop insurance, land rental, supply-chain logistics, commodity markets, and more. For Guan, however, the work's scientific value is as important as its practical value. A set of satellites known as Landsat have been continuously circling the Earth for 40 years, collecting images using sensors that represent different parts of the electromagnetic spectrum. Guan says most previous attempts to differentiate corn and soybean from these images were based on the visible and near-infrared part of the spectrum, but he and his team decided to try something different. "We found a spectral band, the short-wave infrared (SWIR), that was extremely useful in identifying the difference between corn and soybean," says Yaping Cai, Ph.D. student and first author of the work, following the guidance of Guan and another senior co-author, Shaowen Wang in the Department of Geography at U of I. It turns out corn and soybean have predictably different leaf water status by July most years. The team used SWIR data and other spectral data from three Landsat satellites over a 15-year period, and consistently picked up this leaf water status signal. "The SWIR band is more sensitive to water content inside the leaf. That signal can't be captured by traditional RGB (visible) light or near-infrared bands, so the SWIR is extremely useful to differentiate corn and soybean," Guan concludes. The researchers used a type of machine-learning, known as a deep neural network, to analyze the data. "Deep learning approaches have just started to be applied for agricultural applications, and we foresee a huge potential of such technologies for future innovations in this area," says Jian Peng, assistant professor in the Department of Computer Science at U of I, and a co-author and co-principal investigator of the new study. The team focused their analysis within Champaign County, Illinois, as a proof-of-concept. Even though it was a relatively small area, analyzing 15 years of satellite data at a 30-meter resolution still required a supercomputer to process tens of terabytes of data. "It's a huge amount of satellite data. We used the Blue Waters and ROGER supercomputers at the NCSA to handle the process and extract useful information," Guan says. "Technology wise, being able to handle such a huge amount of data and apply an advanced machine-learning algorithm was a big challenge before, but now we have supercomputers and the skills to handle the dataset." The team is now working on expanding the study area to the entire Corn Belt, and investigating further applications of the data, including yield and other quality estimates. The article, "A high-performance and in-season classification system of field-level crop types using time-series Landsat data and a machine learning approach," is published in Remote Sensing of Environment [DOI: 10.1016/j.rse.2018.02.045]. Additional authors include Christopher Seifert, Brian Wardlow, and Zhan Li. The work was supported by NCSA, NASA, and the National Science Foundation. Frozen embryo transfer versus fresh embryo transfer: What's riskier?